Started five years ago, the Manager’s Studio, a program of the graduate school of the Carroll School of Management, provides students with an on-campus opportunity to meet and ask questions of CEOs. Sessions begin with an interview conducted by senior lecturer Robert Radin (left), focusing on career choices and leadership style. 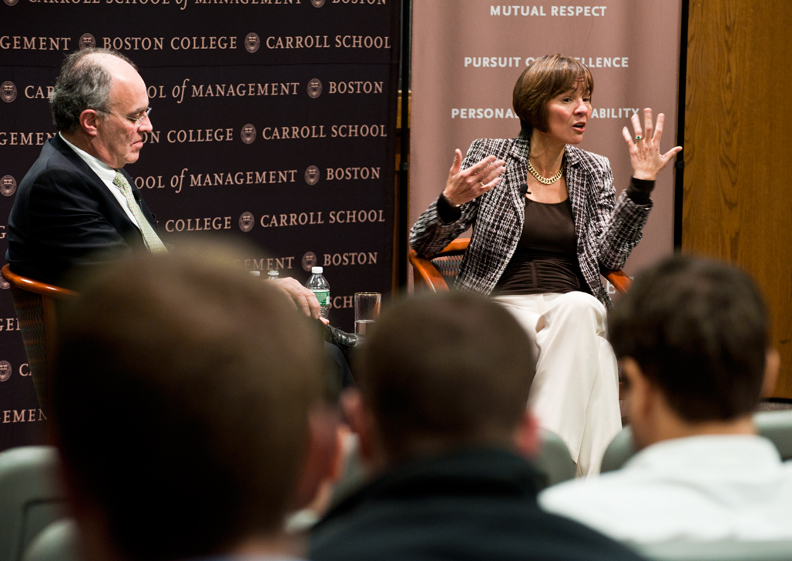 On January 26, Laura Sen ’78, CEO of BJ’s Wholesale Club, the 232nd largest company in the United States, occupied the guest chair, fielding questions before an audience of some 100 students in the Fulton Hall auditorium. In describing her management philosophy, she stressed the value of an informed workforce: “Without people, it’s not a company, it’s just stuff.” Past guests of the Manager’s Studio include Tom Sebok of Young and Rubicam and Dr. James Mongan of Partners Healthcare. This feature was posted on Friday, January 28, 2011 and is filed under Featured Photo.